Bob and I had been looking forward to getting up to the Carden Alvar for at least a couple of years. Our schedule and family commitments just did not allow us the opportunity until this May. 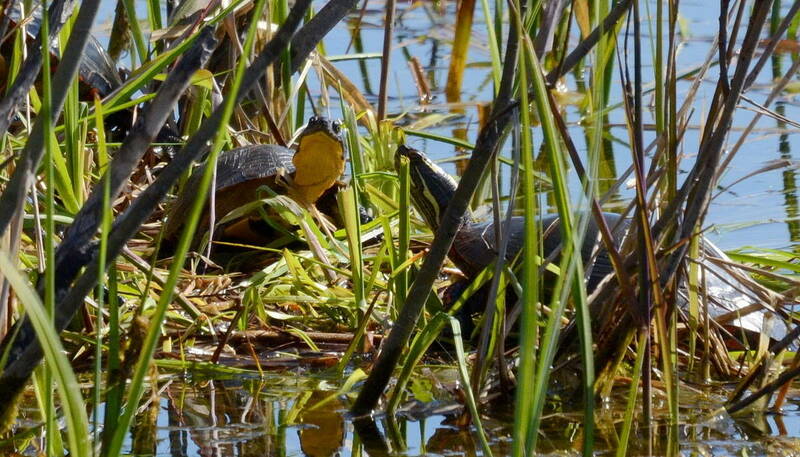 I was filled with excitement at the prospect of seeing a number of early spring migrants and birds that favour the specialized habitat of the alvar plain, so it came as a pleasant surprise to also come across a rare Blanding’s Turtle. Our adventure began when we made the turn going northwards onto Wylie Road. 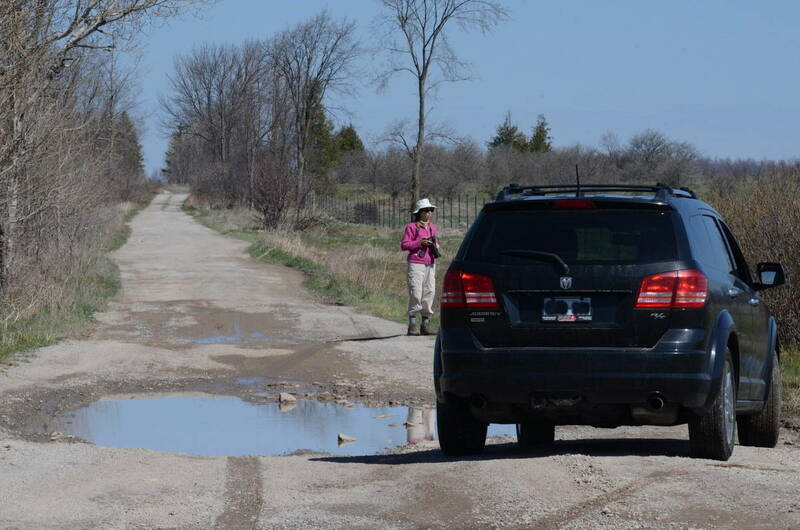 The gravel surface was riddled with sharp potholes and large puddles that required diligence when driving to avoid damaging our car, but we were proceeding very slowly anyway in an effort to spot birds in the meadows. With our windows down despite a stiff cool crosswind, the sounds of nature were music to our ears and beckoned us to make another stop so we could appreciate the finer nuances of nature’s symphony. After the high-pitched chorus of frogs reached a crescendo and were silenced when a trio of Canada Geese flew directly overhead, I started to search the ditch for some of the unseen amphibians. Not being overly familiar with the alvar habitat, we were not sure if the fens and flooded ditches were normal conditions or whether the flooding was the result of spring rainfalls, but in any case, Bob noticed a ruffle on the water and then saw the heads of two Midland Painted Turtles poke through the still surface. 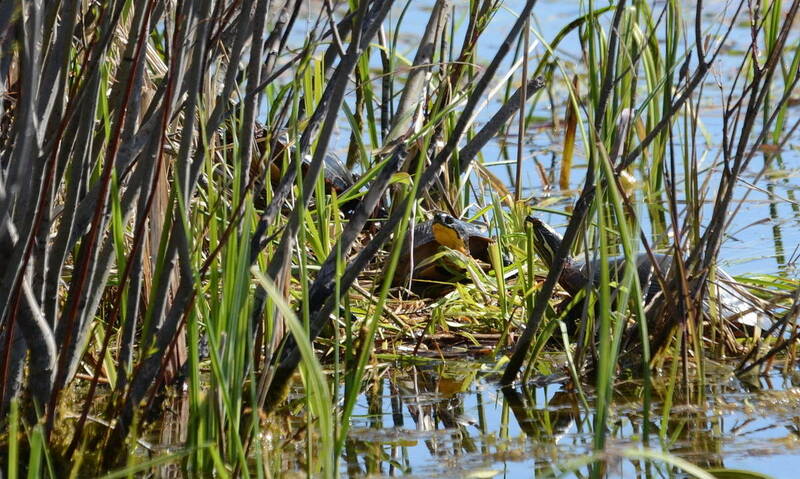 They made for a clump of raised earth that supported some bushes and no sooner had climbed on shore to bask in the sun when we noticed that a Blanding’s Turtle was following in hot pursuit. 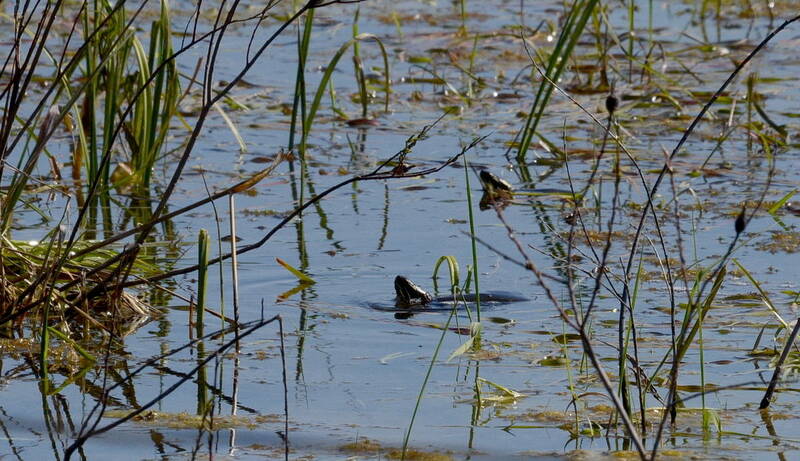 Blanding’s Turtles are a threatened species, and we have only seen one other individual on our travels. That was a number of years ago in Frontenac Provincial Park when portaging on a back-country camping trip. At that time, we were unaware of the significance of our sighting. 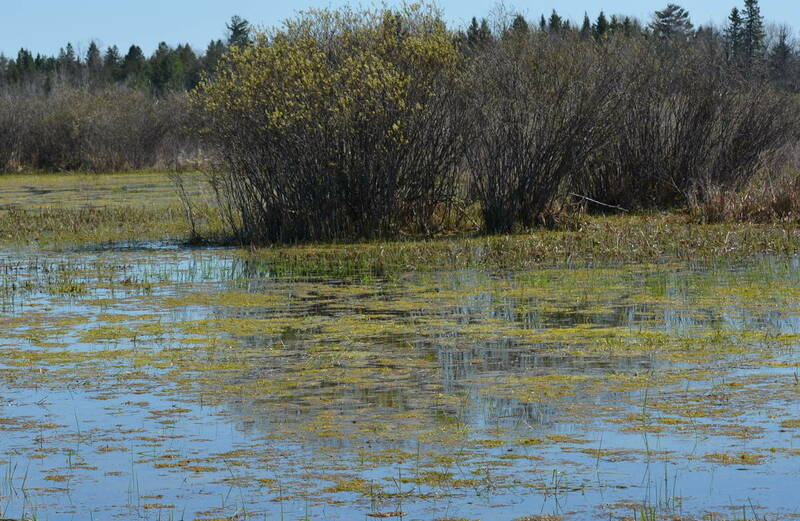 This time, both Bob and I realized how important it was to report the location of the turtle to the Ontario Ministry of Natural Resources at: Report sightings of rare plants and animals. 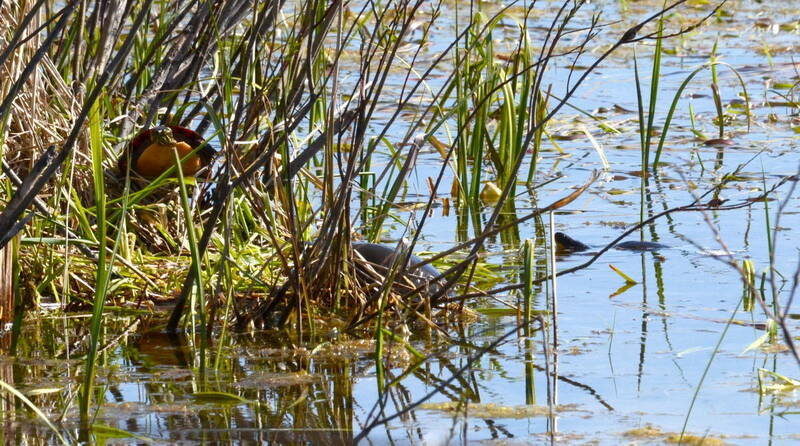 The bright yellow chin and throat of a Blanding’s Turtle is diagnostic so we knew immediately what we had come across. 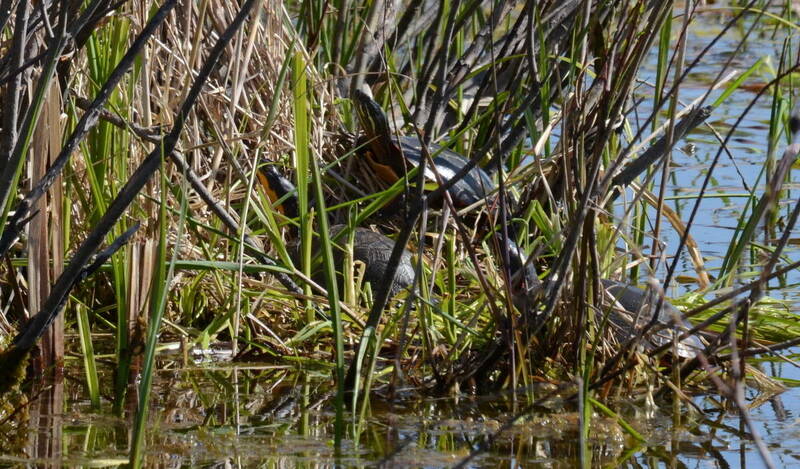 The two Midland Painted Turtles seemed to have no issues sharing the mound with the Blanding’s. In this photo, it is possible to detect the different profile of a Blanding’s Turtle carapace from that of a Midland Painted Turtle. 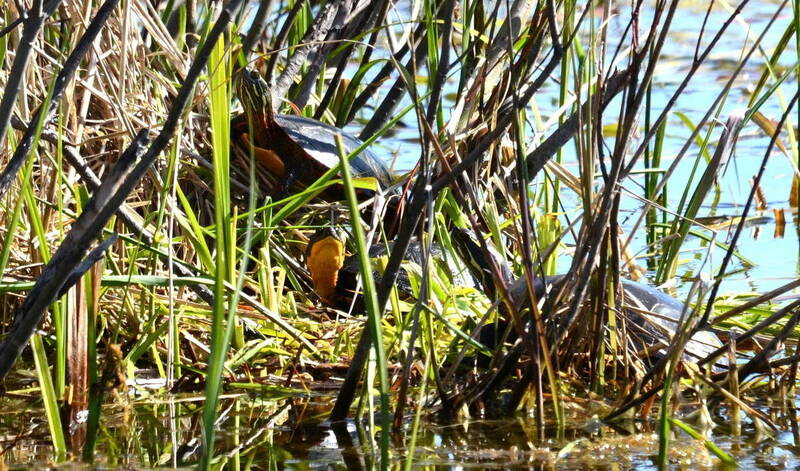 The shell of a Blanding’s Turtle is more domed and resembles an army helmet, whereas that of a Painted Turtle is wider and flatter. 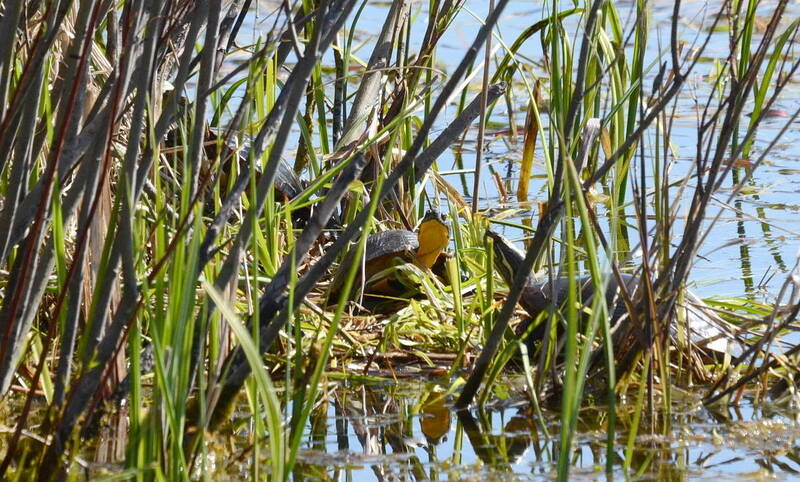 Of all species of turtles in Ontario, Blanding’s Turtles will complete the longest migration from their winter grounds, where they hibernate from late October to the end of April, to their desired summer nesting sites, if it is necessary. Sometimes, they will cover distances up to several kilometres to find a sandy location suitable for their eggs. After observing the three turtles for a considerable length of time, we resumed our patrol of the Carden Alvar for other species of wildlife. 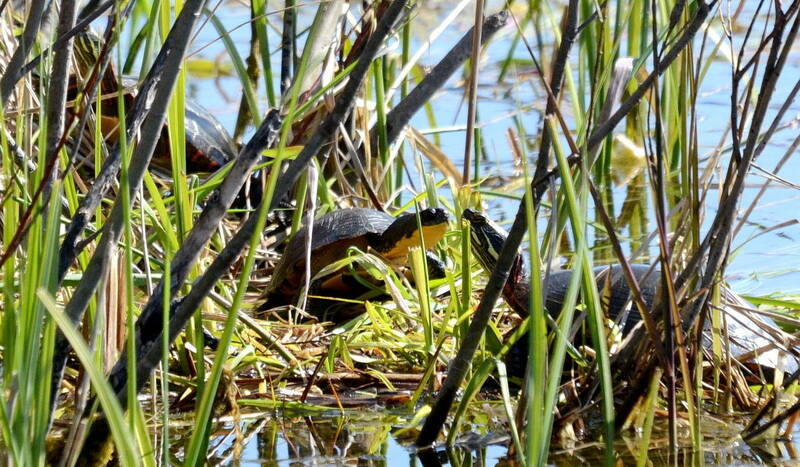 The sighting of a Blanding’s Turtle was sure up there as one of the best encounters we had that day!